The text of this work needs to be migrated to Index:The Hymns of the Rigveda Vol 1.djvu and Index:The Hymns of the Rigveda Vol 2.djvu. The Rig Veda is a collection of Vedic Sanskrit hymns counted among the four Hindu religious texts known as the Vedas. 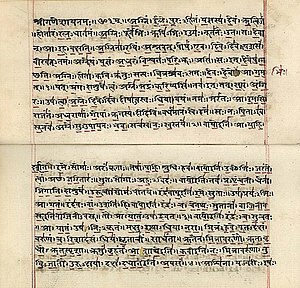 The Rig Veda was likely composed between roughly 1700–1100 BCE, making it one of the oldest texts of any Indo-Iranian language, one of the world's oldest religious texts. It was preserved over centuries by oral tradition alone and was probably not put in writing before the Early Middle Ages. The Rig Veda is considered to be amongst the earliest religious texts still revered by a living tradition and it is estimated to have been formed around 1500–1200 BCE. It consists of 1,017 hymns (1,028 including the apocryphal valakhilya hymns 8.49–8.59) composed in Vedic Sanskrit, many of which are intended for various sacrificial rituals. These are contained in 10 books, known as Mandalas. This long collection of short hymns is mostly devoted to the praise of the gods. However, it also contains fragmentary references to historical events, notably the struggle between the early Vedic peoples (known as Aryans) and their enemies, the Dasa. The first of The Vedas.